kiss my black ads: Forbes Says Tyler Perry & Jay-Z Will Be Billionaires Soon! Forbes Says Tyler Perry & Jay-Z Will Be Billionaires Soon! 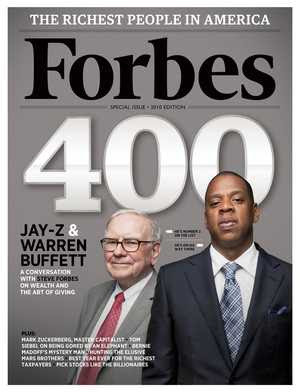 Forbes magazine has released its annual list of the 400 richest people in the USA. And, no surprise, Ms Oprah Winfrey is the only African American on it, with an estimated $2.7 billion worth. In this year’s issue, Forbes also mentions those folks whom the magazine believes will be on the premiere list in the near future, calling them “Billionaires In The Making” (by the way, entry into the club requires that each member have a worth of at least $1 billion). Noteworthy names on the list of “Billionaires In The Making” include the following: Tyler Perry ($350 million estimated) Jay-Z ($450 million estimated) Tiger Woods($500 million estimated) and Michael Jordan (also $500 million estimated). So here’s the billion dollar question in reaction to all these “rich people” lists… So What?